The bounding box is a powerful part of Nuke's compositing ethos. It can help make your scripts more efficient and speed up your renders. Anything outside the bounding box will not be considered when applying defocuses and motion blur for example which is a huge time (and CPU) saver! The autoCrop_MB script runs the Auto Crop in a curveTool on a selected node/s and then copies the data into a crop node. It does this automatically. It will produce an animated bounding box that is tight to the channel you run it on. Only non-zero pixels are kept. It's particularly useful when you receive CG with no bounding box but can also speed things up when coming out of a ScanlineRender. the 'frame range' to 'input' instead of 'global'. It is also possible to choose a custom frame range to analyse. Add the following to your menu.py after placing autoCrop_MB.py in to your .nuke folder. 1) Select node/s to run autoCrop_MB on. 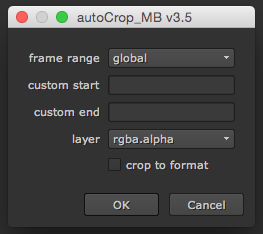 2) Choose 'Run Auto Crop on Selected' from the 'MB Tools' menu. 3) Choose the frame range to run the script on - global, custom or input (if available). If you choose 'custom' please enter the start and end frames. 4) Choose the layer to run the script on. Alpha is best if you have one. 5) Click 'crop to format' if you would like to only analyse the format area and nothing outside it. - Ability to add to BBox after you've run the script. Helpful if your adding the crop somewhere else in your script and adding motion blur for example. - 'crop to format' checkbox now working correctly. - The ability to select a custom frame range added. - The GUI is now not running the crop.py from the nukescripts folder. The auto crop function is built in to autoCrop_MB. - Added the ability to analyse outside the format area. It's a pity that we can't doing this without baking it. It's been years that i wait for the option but it seems that it won't arrive. Is there only me that is interested by this ? I guess it's the computing power that's the problem. It would have to be calculated on the fly.